I originally had the first entry under a different red shirt, but have adjusted. This shirt is a red Carhartt shirt. There’s not much else to say about it. It’s similar in design to Dean’s other Carhartt shirts. Dean likes Carhartt. After the Mark of Cain storyline, many fans began to refer to this shirt (and Dean's Orange Shirt), as "Dean's Murder Shirt." In Party On, Garth (7x18), Dean wears it when he and Sam say goodbye to Garth. In Southern Comfort (8x06), Dean wears it when he, once again, says goodbye to Garth. In As Time Goes By (8x12), Dean breaks the Garth theme, and wears it after he learns that Henry has disappeared to “fix everything” and Dean has to go find him. He wears it until the end of the episode. In Remember the Titans (8x16), Dean is wearing this shirt when he and Sam rush into Prometheus’ motel room to assist him after Artemis attacks. He wears it until the kid dies and they leave the motel to go to the bunker. In Pac-Man Fever (8x20), Dean is wearing this shirt at the beginning of the episode when he comes back to the bunker with beer and food. Except for a brief change into a suit in order to visit the morgue, he keeps it on until Charlie leaves to go get pie. In Bad Boys (9x07), Dean wears this shirt when he and Sam first arrive at Sonny’s to investigate the strange happenings. He keeps it on until after they believe they have successfully salted and burned the correct bones, and then changes before going to the diner to see Robin again. 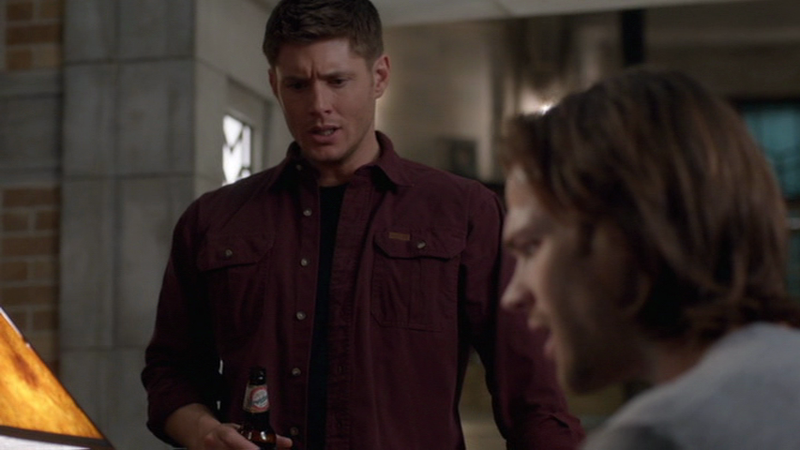 In Holy Terror (9x09), Dean is wearing this shirt in the Bunker, after the church youth group is killed. In #THINMAN (9x15), Dean wears this shirt in the motel when he and Sam are reminiscing about their childhood, just before Ed arrives to come clean with them about Thinman. He wears the shirt until the end of the episode. In Reichenbach (10x02), Dean wears this shirt after killing Lester until the end of the episode. 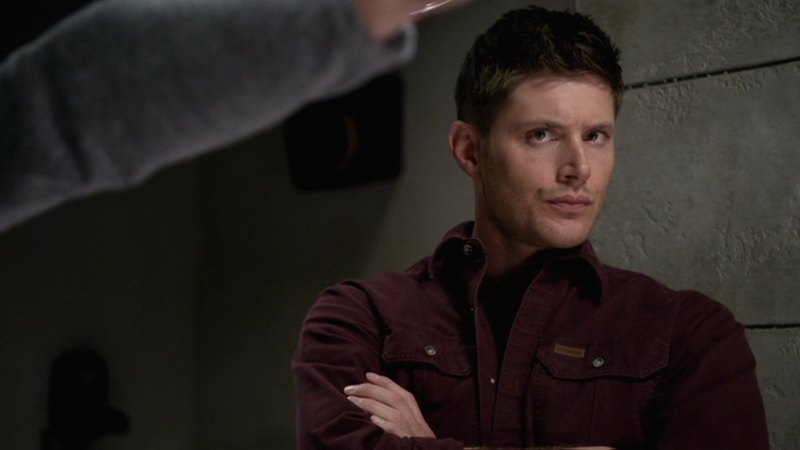 In Soul Survivor (10x03), Dean continues to wear this shirt for the entire episode. In There’s No Place Like Home (10x11), Dean wears this shirt from when he and Sam are staking out the District Attorney’s house, waiting for Charlie to strike, until he leaves the bar to go watch the salesmen and wait for Dark!Charlie to strike there. In The Executioner’s Song (10x14), Dean wears this shirt from the scene where they are researching in the Bunker and discover who Cain’s most likely next victim will be until after he kills Cain. In Brother’s Keeper (10x23), Dean wears this shirt when he summons death and until the end of the episode. In Out of the Darkness, into the Fire (11x01) and Form and Void (11x02), Dean continues to wear this shirt for the entirety of both episodes. In Love Hurts (11x13), Dean wears this shirt in the motel room, when he and Sam are researching and have changed out of their suits, just before Melissa arrives in a panic. He wears it until the Qareen is defeated. In The One You’ve Been Waiting For (12x05), Dean wears this shirt once they get to the diner after investigating the antique shop. He takes it off briefly to wear a suit, but otherwise wears it until the end of the episode – including killing Hitler. In LOTUS (12x08), Dean wears this shirt when they are in the Bunker, trying to plan how to defeat Lucifer now that he’s the President. I absolutely love Dean's red shirt. It is one of my favorites. Red is such a good color on him, it really brings out his coloring and eyes. Dean wears this in 10x02 and will wear it in 10x03! I love it when they recycle clothes. This is purple. I am confused why people say it's another colour (red in this case) when it is purple. The Red Shirt of Bad Decisions! I love this on him. Are you sure that this is Carhartt? This looks extremely similar to a burgundy shirt that's by WindRiver..
That's the old carhartt label on the breast pocket. They don't put those on their newer shirts, but up until about 3 or 5 years ago, every carharrtt shirt had that little brown carharrt label there. The other things you want to check when you're comparing shirts is the angle of the cut on the pocket flap and the seaming on the pocket - whether it has a middle seam/pleat, etc. Those also tend to vary by brand.